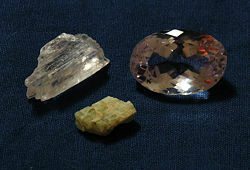 An almost colorless kunzite crystal (upper left), a cut pale pink kunzite (upper right) and a greenish hiddenite crystal (below). Spodumene is a pyroxene mineral consisting of lithium aluminum inosilicate. It has a vitreous luster and occurs in a range of colors. The purplish or lilac variety is called kunzite, and the yellowish-green or emerald-green variety is known as hiddenite. Other crystals range from colorless to yellow. The crystals are often quite large. For example, single crystals over ten meters in size are reported from the Black Hills of South Dakota. This mineral is an important source of lithium, which in turn has a range of applications, including its use in certain types of batteries, ceramics, and pharmaceuticals. In addition, kunzite and hiddenite are valued as gemstone material. The name spodumene is derived from the Greek word spodoumenos, meaning "reduced to ashes." It refers to the opaque, ash-gray material that is formed when the mineral is burnt, such as for industrial use. Spodumene occurs in lithium-rich granites and pegmatites. Kunzite has been found in Brazil, United States, Canada, Commonwealth of Independent States, Mexico, Sweden, Western Australia, Afghanistan, and Pakistan. Large quantities of hiddenite have been mined from North Carolina. In addition, hiddenite has been found in Brazil, China, and Madagascar. Green spodumene found in Afghanistan and Pakistan has excited modest controversy in the mineral and gemological communities. The debate has been over whether it should be truly considered "hiddenite," amid claims that the green coloration could have been induced by irradiation. The chemical formula of spodumene can be written as LiAl(SiO3)2. It has a hardness of 6.5-7 on the Mohs scale, and a specific gravity of 3.17-3.19. Kunzite and hiddenite are noted for their strong pleochroism. Crystals of spodumene are formed in the monoclinic system and are typically heavily striated parallel to the main axis. The crystal habit is prismatic, with flattened and elongated shapes. Crystal faces are often etched and pitted with triangular markings. The pink to lilac color of kunzite comes from minor to trace amounts of manganese. Some (but not all) samples of kunzite used for gemstones have been heated to enhance their color. This variety of spodumene was named in honor of New York mineralogist and gemologist George Frederick Kunz. The first specimens of hiddenite were recovered about 1879 near the tiny settlement of White Plains, west of Stony Point, Alexander County, North Carolina. According to contemporary accounts, a young man named Lackey brought them to the attention of J.A.D. Stephenson, a local merchant who was an ardent collector of minerals. Initially, the samples were thought to be gemmy diopside. Hidden recognized the value of the emeralds and the potential of the new gemmy green spodumene. He acquired a tract of poor quality land, which was either the site of the initial discovery or near it, for $1,500. The Emerald and Hiddenite Mining Company was organized, and excavations on the site quickly recovered loose hiddenites and emeralds in the red, gravelly clay. At a depth of about 26 feet, they struck bedrock and soon began recovering hiddenites from solid rock. Oddly, period newspaper accounts and statements by Kunz (1892) indicate that mining on the site was never undertaken as a full-time operation but was only prosecuted a few weeks or months during the summer. Writing in 1892, Kunz described the hiddenite being recovered as “always transparent, ranges from colorless (rare) to a light yellow, into a yellowish green, then into a deep yellow emerald green. Sometimes an entire crystal has a uniform green color, but generally one end is yellow and the other green.” Kunz noted that the finest crystal recovered prior to 1892 measured 68 millimeters tall, and could have cut a gem of 5.5 carat estimated weight. The size of most cut gems were small, with a two-carat hiddenite in the Augustus C. Hamlin collection being considered amoung the finest of the large stones. Transparent spodumene, particularly the kunzite and hiddenite varieties, are valued as gemstones. In addition, spodumene is an important source of lithium, which in turn is used in industrial ceramics, mobile phone and automotive batteries, and medicine. Lithium is also a fluxing agent. World production of lithium from spodumene is around 80,000 metric tons per annum, primarily from the Greenbushes pegmatite of Western Australia, and some Chinese and Chilean sources. Yet, spodumene is becoming less important as a source of lithium due to the emergence of alkaline brine lake sources in China and Argentina, which produces lithium carbonate and lithium hydroxide directly. Genth, F. A. 1883. Hiddenite. American Journal of Science 23:68. Palache, C., S.C. Davidson, and E.A. Goranson. 1930. The Hiddenite deposit in Alexander County, North Carolina. American Mineralogist 15:280. All links retrieved October 17, 2015. This page was last modified on 17 October 2015, at 15:10.